The study coordinators are, Dr. A. S. Lopatin, president of the Russian Rhinology Society and Dr. G. Z. Piskunov, associate member of the Russian Academy of Medical Sciences. The objective of this study is to obtain data to improve both knowledge and the treatment of chronic rhinosinusitis. Stage I: Cross-sectional analytical multicentre study using randomized individual standardized interview (questionnaire) “Conventional practice of chronic rhinosinusitis treatment in Russia”. Stage II: “Multicentre observational epidemiologic study with the aim of studying the efficacy and safety of treatment regimens for patients with chronic rhinosinusitis exacerbation”. This non-interventional observational prospective epidemiologic study is focused on the examination of chronic rhinosinusitis exacerbation treatment practice by means of evaluating clinical outcomes, treatment regimens and treatment cost. Evaluation lasts up to 6 months after patient inclusion. Eighteen centres from all over Russia participate in the study, with 21 patients from each centre. During the follow-up period the attending medical doctor performs treatment and monitoring of patients according to established standard clinical practice. During this non-interventional prospective epidemiologic study, data for 5 time periods are to be registered. Patients are randomly allocated to one of the treatment regimens included in the study. When chronic exacerbations occur, the different treatment regimens being followed, together with their outcomes, are assessed. All values of treatment results, treatment changes and volume of additional diagnostic interventions are fully registered in CRF for analysis of clinical outcomes in patients with chronic rhinosinusitis exacerbation. Stage III: “Study of the spectrum of bacterial causative organisms associated with chronic rhinosinusitis”. The aim is to examine the spectrum of microorganisms (aerobic and anaerobic) in the contents of the maxillary sinus cavity in patients with chronic rhinosinusitis, and also to study their susceptibility and resistance to different antimicrobial drugs. Material sampling during maxillary sinus cavity paracentesis is performed in 4 clinical centres. Each centre selects 40 patients (Each centre in Moscow selects 20 patients). In the study, patients of both genders will participate with symptoms of “chronic rhinosinusitis” present. During two-sided process, material for cultural study is withdrawn separately from each maxillary sinus cavity. All tubes with biological material are transferred and analysed in, Smolensk State Medical Academy. Stage IV: “Incidence of nasal and paranasal sinus diseases in Russia”. Questionnaire: respondents are adult population (patients visiting ambulatory clinic for health assessment (ENT focus), medical institution specialists, medical university students, patients visiting clinic for reasons not associated with ENT- specialisation). Survey of 3,000 people is planned. All stages are performed concomitantly. Report of the final results for the “CHRONOS” project is expected around the end of 2013. 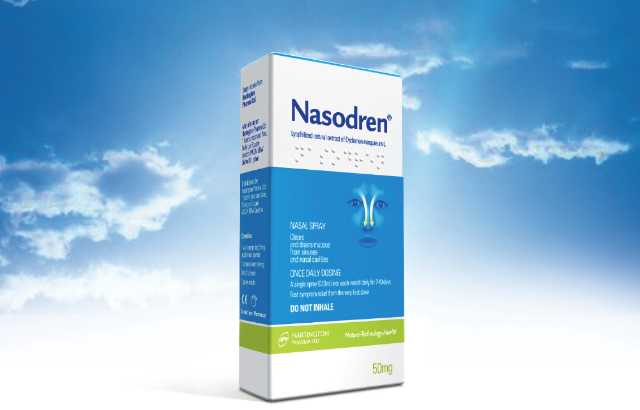 Can Nasodren® be used after surgery? Does Cyclamen extract work for otitis?